Blizzard Entertainment arrived at Comic-Con International: San Diego with a surprise reveal for fans of Overwatch®: a sneak preview of the NERF RIVAL OVERWATCH REAPER WIGHT EDITION blaster. Designed in the style of Reaper’s signature accessory in Overwatch, the blaster is not only true to the game, but also a fully functional NERF toy. The Wight Reaper Blaster is the first in the series developed in a collaboration between Blizzard Entertainment and the NERF Rival brand to bring the iconic Overwatch accessories to life. Fans of the team-based action game will enjoy custom NERF RIVAL rounds with the Overwatch logo that are specifically colored for each blaster. The blaster will hold eight NERF RIVAL rounds, which it can propel at up to 90 feet per second. It will be equipped with a spring-action mechanism, a ready indicator, and a safety lock. The NERF RIVAL OVERWATCH REAPER WIGHT EDITON blaster will launch in 2019. Discuss! Image direct from Hasbro, not a screencap from the video! Overwatch logo'd ammo? Color-specific? Could be collectible, if that's what you like. No telling still on the price, but here's hoping it avoids the price of some licensed goods as the Boba Fett or Deadpool Nerf Rival sets were at first. Functionality wise, some folks are hoping for a hammer style prime. My guess is sliding pump-action under the barrel. There's a chance that hammer could be a pull handle for a priming arm, but I hope that isn't the case. It says 8 round magazine, and I'm thinking it loads from a door by the hammer, where that little piece sticks up. Another theory (but maybe the least likely, considering the performance) is the blaster shoots two rounds simultaneously like the Nerf Rival Atlas. The barrels could be the indicator, but considering the performance of the Atlas on the second shot, I hope that's not the case. Give me 8 good shots at 90 fps and don't worry about multishot lackluster madness. Ultimately, we won't know until it hits prototyping, and by then it will hopefully be February if something hasn't leaked by then. 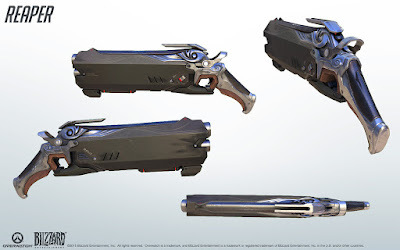 I don't have much hope for the price to be reasonable, BUT there's a good chance (as with the Deadpool blasters) that these blasters will be released in non-Overwatch skins for a bit lower price as well, that will just take time. What do you think? Play of the Game or utter Defeat?